In days past, being the face of the Olympic Games was a matter of retrospection. Jesse Owens, Bob Beamon, Mark Spitz - they all went into their competitions free from huge expectation. Nowadays, the Face of the Games is decided long in advance, probably by a baying committee of tubby journalists. This poor soul's own personal goals become the hopes for all of humanity, meaning failure won't just be a personal disappointment. In recent years, these poor souls - Michael Johnson in 1996, Cathy Freeman in 2000 - have managed to come out of the pressure cooker having achieved their goals. 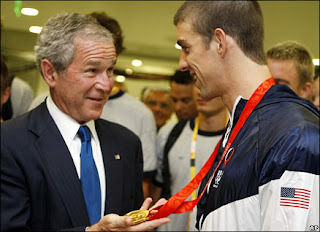 Beijing's cause célèbre, US swimmer Michael Phelps, currently remains on target for his unprecedented 8 golds in 8 days. But my word, he must be knackered. Swimming is perhaps the sport I have watched the most of at the Olympics in recent years. This is mainly because the BBC's coverage of it is particularly thorough, but also because it has that great quality for any Olympic sport - what the competitors are trying to achieve is completely obvious even to the uninitiated. Within this, however, I have to say that the racing in the pool interests me because it has an artificiality to it that its track counterpart does not have. Take, as an example, the 400m Individual Medley, the scene of Phelps' first gold of the games. Eight lengths of the pool, 2 each of butterfly, breaststroke, backstroke and freestyle. I think that this would translate brilliantly to the running track. It would also make the Olympics more accessible and understandable to any of us who ever competed in a school sports day. The 400m Individual Running Medley would be one lap of the track, the first 100 metres backwards, then similar increments of hopping and an egg and spoon element, ending with 100 metre freestyle. 'Freestyle' is also something of a misnomer, I find. Everyone swims the exact same way. There is more demonstrable variation in individual swimmer's breaststrokes than there is in the freestyle, and I think this is a shame. I'd be thoroughly supportive of any swimmer who decided to totally be-bop his freestyle element. Because the sad fact is, 'freestyle' is in fact the name given to a stroke which should really be called 'fastest style', to try and blind the watching public to the fact that the swimmers could actually be going a lot faster than they are, when they're flailing around with elbows flying. Nevertheless, for all this artificiality, I do love watching the Olympic swimming, and the ongoing Michael Phelps story gives the whole thing a welcome Hollywood aspect. The sport I particularly enjoyed today was the women's Archery. Again, it is a sport which benefits from crystal clear objectives and scoring - compare, for instance, to Judo, which to the casual viewer looks like people in pyjamas re-enacting the fireplace scene from Women In Love. The final was fairly comfortable for the Korean team, who last didn't win this event at the Moscow Olympics in 1980. It would have been a Herculean feat for them to win that year, as they were boycotting the games. Their opponents yesterday were the China team, who delighted me. Firstly, they all pulled their bow strings back and made their noses and lips go like a wonky Elvis. Secondly, one of their number - as a result of this - had a black line up the middle of their face. I suspect that Guo Dan had falled victim to a Chinese Archery team prankster. The inky bowstring. The old classic. The competition also put me in mind of the mooted inclusion of darts in future Olympiads. The skills required, it is beyond argument, are very similar to the ones I saw on display yesterday. The problem lies in something I did not see yesterday. A single morbidly obese competitor. I honestly think that the only thing holding darts back from serious Olympic consideration is the general appearance of the competitors, but this is something which could surely be sidestepped by having a boxing-style weigh-in. Or weightlifting-style weight categories. The sight of tattooed and bejewelled darts players in the Olympic village, scarfing down pies in a last-ditch attempt to get up to 179kg, it would virtually be a sport in itself. Yesterday saw the passing of one of your actual living legends, Isaac Hayes. Hayes will probably be remembered as the bloke who did the voice of Chef until he was subsumed by Scientologists. But he shouldn't be. Remember him as the first African American to win an Academy Award for a film score. Remember him as having written any number of the greatest soul songs of all time. Better yet, listen to his 1969 album Hot Buttered Soul - my all-time favourite soul record - and remember him like that. R.I.P., Isaac Hayes.